Awhile back, reading Jane Mayer’s excellent non-fiction book of the U.S. reaction to 9/11, The Dark Side, it inspired a need to wax on two of my favorite films by an Italian-born American film director, producer and writer. Darkness easily seductive in a number of ways. The two films in question lay on either side of a calamitous chasm for one of the revered filmmakers of the 40s, Frank Capra. Ironically, they were released within two years of each other. At first glance, they are quite disparate. Still, each share a couple similar traits, beyond their great direction, cast and notable screenplay. It’s my belief central shadowy elements drive, as well as haunt, both Arsenic and Old Lace and It’s a Wonderful Life. The former released in the 1944 though Arsenic and Old Lace was initially filmed in 1941. Right before Capra went to work making movies for the WWII War Department. For family movie night on a final weekend in November a few years ago, my wife suggested this particular movie because she didn’t want to get into any Christmas movie, which our kids were clamoring for, before December arrived. My family’s reaction to this comedic darling caused the itch this piece intends to scratch. Adapted from the Joseph Kesselring stage play, Arsenic and Old Lace is a black comedy that has well stood the test of time. 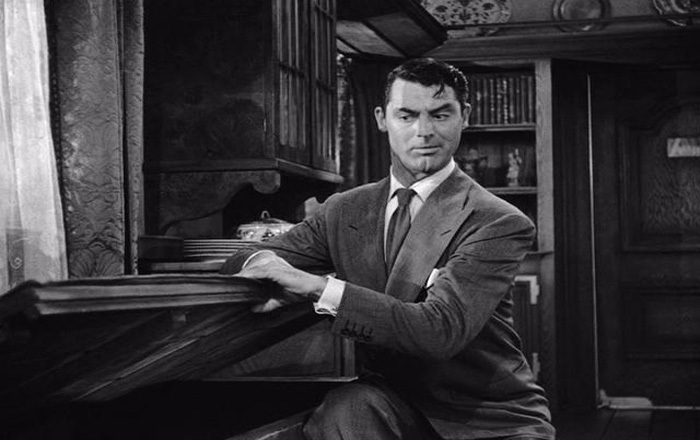 The film adaptation starred a young Cary Grant performing some of the best double-takes in cinema history1, in my opinion. The nephew to a jolly pair of kindly old aunts who just so happen to have a lethal calling, and who’ve kept a shadowy secret from most. Especially their dearest relation. As Mortimer Brewster, Cary’s character is forced one Halloween in Brooklyn to confront the rampant insanity of his relatives. Seemingly peaking on this one autumn night. All of them complicit, even renowned, in the way of murder. Here and abroad. It remains one creepy original story taken to a comedic and entertaining extreme. Coinciding on Mortimer’s wedding day also serves as a surprising counterpoint. For such a funny film, Frank Capra framed a good amount of Arsenic and Old Lace in shadow, care of Sol Polito‘s stellar black & white camera work, which is used to imply the spectre of death close by. When our comedic hero is captured by his psychotic brother, played with villainous glee by Raymond Massey (with nervous henchman Peter Lorre assisting), the director didn’t soft-pedal his peril or the scene’s starkness. The lack of light in this sequence in the film is key. Made a conscious impression on me when I first saw this on TV as a young teen when a bound Mortimer is given a verbal prelude of his slow, torturous demise by his sibling. It was at this point my then nine-year old daughter chirped, “This is supposed to be a comedy?! ?” Couldn’t help but smile as I’d the same reaction decades ago. To that point, no other film sequence, save for Bela Lugosi’s grisly promise to the bound Boris Karloff2 at the climatic point in The Black Cat (1934), ever disturbed me as much. Still, it’s the mix of hilarity and potential painful death that somehow made this movie so diverting. A pitch-black one, for sure. The comedy highs balanced beautifully by their negative…the analog threat of tragedy. Which segues us to the latter film. Not only one for the ages, but an annual yuletide celebration for many. Interestingly over the weekend, my son mentioned wanting to see it again. Thinking his first and only time with it as a pre-teen, he didn’t appreciate it. So we’ve scheduled the 1946 It’s a Wonderful Life once more. Simply Frank Capra’s finest film3. Even it’s headliner, James Stewart, admitted that it’s his, too, years later. Joseph F. Biroc, Joseph Walker, and the uncredited Victor Milner would share director of photography duties throughout the production. For the elation audiences reach by the film’s end, it’s essentially a noirish-themed movie4. Stewart’s George Bailey character is by accounts a good man wronged. Life in all her wisdom’s laid him low, paraphrasing Michael Franks. Kept in place by circumstances beyond his control. The Bedford Falls native’s boyhood dreams of travel and adventure seemingly crushed by a life of familial obligation. Having lived in his own world of self-sacrifice toward family, and the small close-knit community around him, seemingly buying George Bailey nothing. The quote is It’s a Wonderful Life in a nutshell. Its story-line one that touches, at times wrenchingly, life’s inequities and what-if’s. And though it has many moments of sheer joy within the film, Frank Capra counterbalanced it with some pretty gloomy situations. Most of which nightmarish in nature, and recognizable by all who sit and watch it. 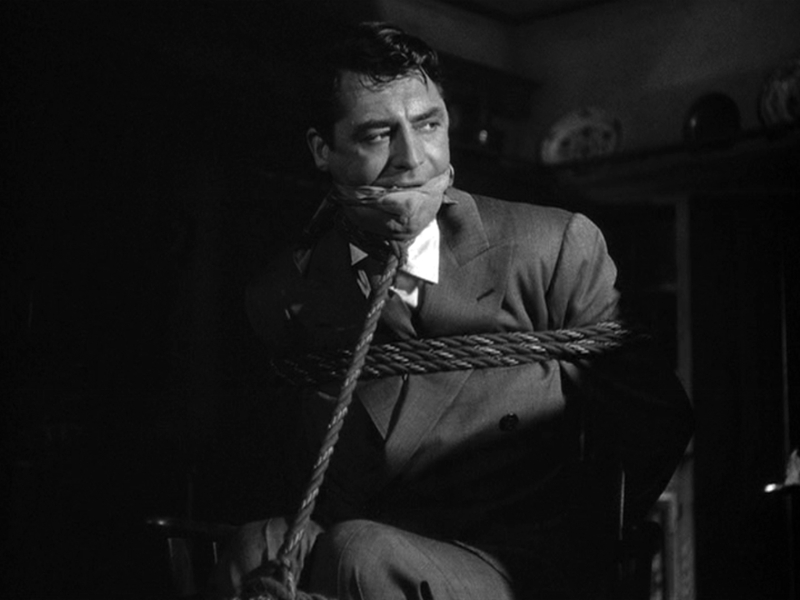 But again, like Arsenic and Old Lace, it’s the film’s dark undertone that brought out its best parts. 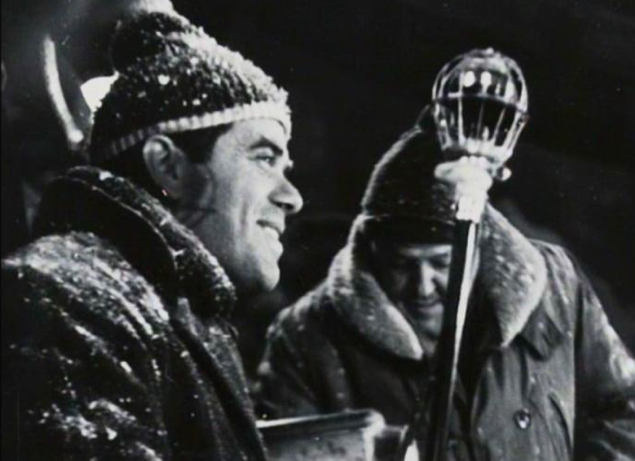 No doubt by this time, after the war, Capra’s outlook as a filmmaker, as someone who seen the carnage such things bring about firsthand, had shifted somewhat. 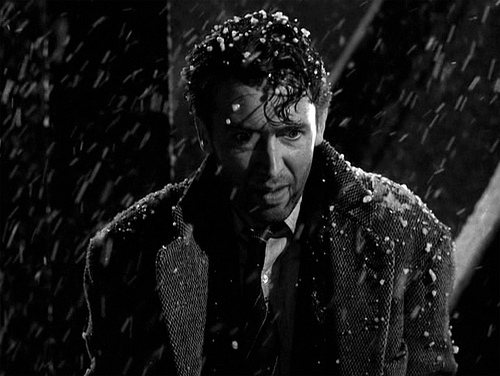 It’s a Wonderful Life bestowed a heavenly sense through its use of a little Hell. In other words, you’re not going to have a silver lining without that dark cloud to show it off. Ask yourself this, “Would Ebenezer Scrooge’s heart have been opened without being shown the spectres of Want and Ignorance?” I say no. He wouldn’t have. I say It’s a Wonderful Life has more substance than many give it credit. Why it stands up to repeated viewings so well. Capra’s adaptation of Philip Van Doren Stern story more than the sum of its parts, with a meaning that changes over time. Or its umpteenth showing. Compared to those screening it for the first time, or in their youth, to those of a certain (ahem) age and you’ll have undoubtably a very different take. Little wonder N.Y. Times film critic A.O. Scott showcased it in his Critics Picks awhile aback (see it here). Frank Capra was a gifted filmmaker who knew how to use the qualities of light and dark to make his movies register that much more. Darkness playing a distinct part in two of his most influential and warmly funny movies. Intriguingly, if you remove Capra’s war-time films, these commercial works bracket World War II5. That conflict’s notable affect upon the director is most obvious when it comes to the latter film. Yet, imagine how different would Arsenic and Old Lace have developed had it been taken on by Frank Capra only after the war ended? Or if It’s a Wonderful Life had gone before the camera prior to that? How much darker, or lighter, would each have been then? I for one wouldn’t change a thing, though it’s food for thought. “You’re not going to have a silver lining without that dark cloud to show it off.” You are so right. I never thought of pairing these two films together and showcasing the dark undertones and connecting it to Capra and WWII. Well done, Michael. My humor must be dark as ebony because these 2 films are my favorites- Arsenic and Old Lace is actually my favorite film of all time and It’s A Wonderful Life is my favorite Xmas film (which is saying a lot because I adore Xmas films). Let’s face it, Capra was genius but so were Grant and Stewart too. I’ll never tire of watching these films over and over. Ah, what classics these two are. And what a great double bill! Fine work as always. Two fabulous movies starring two of the best actors to ever grace a big screen. Love them both. Loved the write-up. Love IT’S A WONDERFUL LIFE and it always surprises me every time I watch it just how dark of a film it is. Same with that other Capra classic MEET JOHN DOE, which is also a very dark, holiday-themed movie. So many facets to this great film, for sure. Yes, MEET JOHN DOE is another Capra gem, J.D. Totally agree. Many thanks, my friend. I’m a kind of annual “One and done” with “It’s A Wonderful Life”. My older sister loved it and “White Christmas” growing up. So I have most of both films’ dialogues memorized. We still argue over which song and dance routine is best. I lean towards the Crosby/Kaye dubbed duet of ‘Sisters’. And Kaye’s too hip by half ‘Choreography’. Where Sis leans towards ‘Snow’ and the title tune. That said. 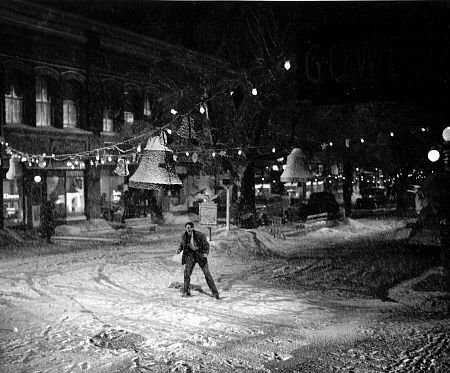 I really appreciate how dismal, dark and bad “Pottersville” turned out to be opposite the bright and happy ending of “It’s A Wonderful Life”. While “Arsenic And Old Lace” is an anytime film. A stage class with Cary Grant at his wide eyed, early rapid patter and aside, Vaudeville pratfall best! Taking his well learned use of facial expressions out to play. While leaving time to be a loving nephew and leading man. With Uncle Teddy showing up at odd intervals to throw a curve ball. An intriguing, funny as hell mix, well executed! Another excellent comment, Kevin. These great films bind families like nothing else. Thanks so much for sharing this and your thoughts on the matter, my friend. That’s a lovely appreciation of two great films, Michael. There’s something about the darkness that makes them special – maybe the fact it lets the light, the sheer celebration of humanity, show through all the more clearly. I haven’t watched either one for a couple of years now – fear of them becoming too familiar perhaps – but I’ll certainly be giving It’s a Wonderful Life a spin in the coming days. The ending always brings a tear to my eye – I know, I’m becoming a sentimental old fool – but there’s such a joy to it too. I love It’s a Wonderful Life!